Be the first to share your favorite memory, photo or story of Alta. This memorial page is dedicated for family, friends and future generations to celebrate the life of their loved one. Alta nee Platter Seidel, of Athens, GA, formerly of central Missouri, passed away Friday, November 30, 2018 at the age of 85. She was born in Success, MO on February 16, 1933 to the late James Platter and Adda (Burton) Platter. In 1950, Alta married Ira Seidel who preceded her in death on May 24, 2011. In addition to her parents and husband, she was preceded in death by an infant daughter, Karen Seidel, her son, Ronald Seidel, two brothers and four sisters. 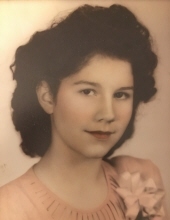 Alta will be greatly missed by her surviving family which includes her daughter, Kara Seidel, of Athens, GA; one brother, Rolla Platter, of St. Louis, MO; three grandchildren, Tyrel Seidel, of Athens, GA, Zachary Seidel, of MO, and Matthew Seidel, of Kansas City, MO; a sister-in-law, Sarah Maxwell. She is also survived by numerous nieces and nephews. Alta willingly and lovingly served as the matriarch of her family, including her numerous extended family members. A funeral service honoring the life of Alta Platter Seidel will be held at 12:30 pm Saturday, December 8, 2018 at the Null and Son Funeral Home in Rolla. Interment will follow in the Rolla City Cemetery. A visitation for family and friends will be held prior to the service Sat. beginning at 10:30 am at the funeral home. Memorial contributions are suggested to either the American Heart Association or the American Cancer Society. To send flowers or a remembrance gift to the family of Alta Seidel, please visit our Tribute Store. "Email Address" would like to share the life celebration of Alta Seidel. Click on the "link" to go to share a favorite memory or leave a condolence message for the family.